If you spend $30 on any Melissa & Doug product at Mastermind throughout the month of September, you will get a free floor puzzle ($18 value). I love Melissa & Doug toys and the floor puzzles are great. I think this is a great deal! However, if you are only interested in the Melissa & Doug floor puzzles, please do yourselves a favour and buy them at Winners for $9.99. More Personalized Gifts @ KidSpot + Mamapicks Exclusive Deal! KidSpot recently opened in Vaughan Mills and offers great personalized gifts for kids. From towels, hats, and bags to stuffed animals…everything can be embroidered with a name of your choice. It’s all done on the spot and your items can be ready in about 15 minutes. KidSpot is offering Mamapicks readers the personalized toddler backpacks for only $15 each! Just visit KidSpot across from Winners and mention that you heard about them through Mamapicks. These bags are great for daycare or after-school programs. If you need some neat gifts on a budget, these bags are sure to please! Current promotions also include: 2 personalized towels for $40. Posted in Cool Products, Deals, Exclusive Discounts, Gifts, Personalized. Becoming Maternity & Parenting Centre is a warm and inviting place for expectant parents and families of kids (ages 0-8 yrs.). The center offers classes, seminars and counselling services for every stage of becoming and being a parent – from pregnancy and adoption to early parenthood. This is a great place to meet other parents from your community and share in the most rewarding and challenging of life’s transformations! Becoming is opening its Thornhill location on Thursday, September 3rd. There will be guest speakers, giveaways and free demo classes (for ages 0-8yrs.) throughout the day. Check here for more information and to pre-register. Mamapicks readers receive 10% off your first purchase of classes or products until Nov. 30th, 2009. Just mention that you read about the opening here. The Midtown Open House takes place on Tuesday, September 1st at the Avenue & Eglinton location starting with Breakfast Television from 6-9am. There will be great giveaways, guestspeakers and free demo classes (for ages 0-8yrs.) all through the day. Check here for the class schedule and information for taking part in Jennifer Valentyne’s live broadcast from this location. Pre-registration for demo classes required. Posted in Activities & Events, Deals, Useful Info. I love this set of 25 plastic wall flowers by Umbra. They come in pink, white, green and black and can dress up any wall that needs a bit of umph. You can arrange them any way you like. Now on sale at Urban Barn for $25 (was $35). There are 10 store locations in Ontario! Posted in Cool Products, Deals, Decor, Gifts, sale. This is the third part of my walk on West Queen West ( between Bathurst and Trinity Bellwoods Park). See Part I & Part II. The stores in this area are so unique. Lots of artsy stuff, original fashion, lovely furniture stores and lots of great finds for kids. The things you find here, you won’t find anywhere else. Stores here open rather late and are closed on the odd day so if you have something specific in mind, best to call ahead to check their schedule. Click “Continued…” to read about the first 3 stores. Posted in Activities & Events, Cool Products, Coupons, Decor, Gifts, Ideas, Useful Info. If it rains this weekend and you are looking for an indoor escape, Hillcrest Mall (Rutherford & Yonge St., Richmond Hill) is offering two performances. Celebrate instruments with Mystic Drums on Saturday @ 12pm and see one of Canada’s finest children’s performers, Dan The Music Man on Sunday at 12pm. Both shows will be held in the mall’s centre court. 40% Off One Item @ Gap Stores! Click on the coupon and print a copy! Valid: Aug. 28th – Sept 3rd. Skill Testing Question: If each of my kids and grandma hold a coupon will I be able to get away with three more items? Funky Ways to Print Your Photos! One of my favourite finds (ever!) are mini-cards by Moo. They are very sturdy little rectangular cards that you can print anything on. Use up to 100 full colour photos, designs or text to make business cards, mom-calling-cards, or gift tags. Mini cards can be kept in a sleek plastic mini-card holder which makes for a great gift. Definitely more original than wallet photos! Moo makes it easy to create with their friendly interface and great prices. Get FREE SHIPPING on your first order by using code: 2YEAZA until August 31st. Using my Visa card has always been fun…but with coupons from Visaperks.ca, you can actually save at stores such as Old Navy, Gap, and more. On this warm evening, we used our Visa at Marble Slab Creamery and got a free cone. Print out your coupons on the website. Enjoy BuskerFest at St. Lawrence Market (Front St. between Church + Jarvis). Thursday- Sunday. Talented street performers will delight the whole family. There will be more special activities for kids including workshops and crafts too! Movies for Toddlers will be screening Thomas & Friends™: Hero of the Rails The Movie! Movies for Toddlers is a pretty recent and wonderful concept in family entertainment.If you have kids between the ages of 2-5, and you are looking for an indoor activity this weekend, hit the theaters for a kid-friendly one-hour film with softer sound and brighter lights. Reasonably priced at $5.00 per toddler and accompanying adults are free! For locations and show-times, visit the website. *** Update: As of Aug. 28th, this event has been canceled due to the inclement weather forecast! Family fun at The Shops at Donmills on Saturday & Sunday 12pm-4pm. Challenge your sense of gravity with the Gyro Space Ball, climb the rock-climbing wall, go through the circus obstacle course or just splash around in the fountain! The Gems of West Queen West! I don’t get to go downtown very often but when I do, my favourite area to explore is West Queen West. I start my walk on Queen and Bathurst and stroll to Trinity Bellwoods Park. The stores in this area are so unique. Lots of artsy stuff, original fashion, lovely furniture stores and lots of great finds for kids. The things you find here, you won’t find anywhere else. Stores here open rather late and are closed on the odd day so if you have something specific in mind, best to call ahead to check their schedule. Check the website for the 3-part series. Enjoy BuskerFest at St. Lawrence Market (Front St. Btwn. Church + Jarvis). Thursday- Sunday. Talented street performers will delight the whole family. There will be more special activities for kids including workshops and crafts too! For more weekend activities, visit the Mamapicks website! Sometimes I find a wonderful item only to realize that it’s not available in Canada. Why do they have absolutely everything across the border? I know that our health system might be better but… I want these popsicle molds so that I can make all kinds of real-fruit concoctions in order to sneak some vitamins into The Boy. He once got a candy ring in a loot bag and still dreams about it. I just know these would be a complete success. Made by Tovolo and available at Amazon & Wrapables. 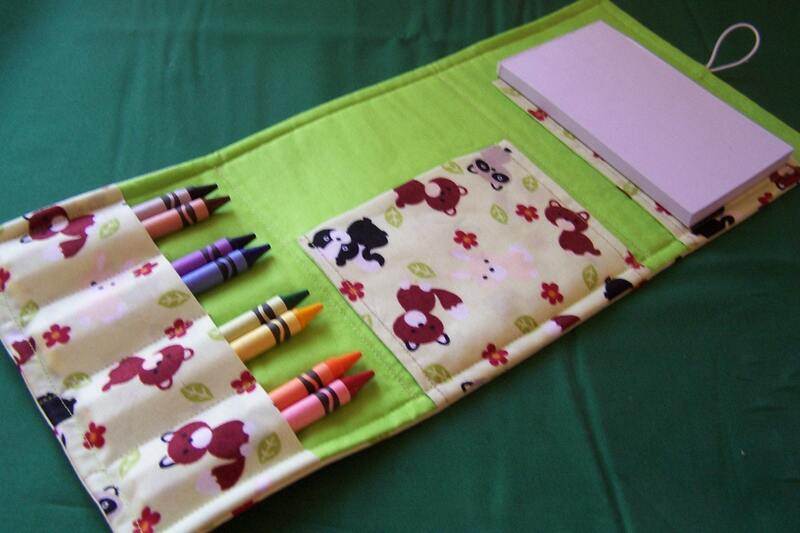 This adorable colouring wallet for kids comes in a variety of fabric choices for both boys and girls. 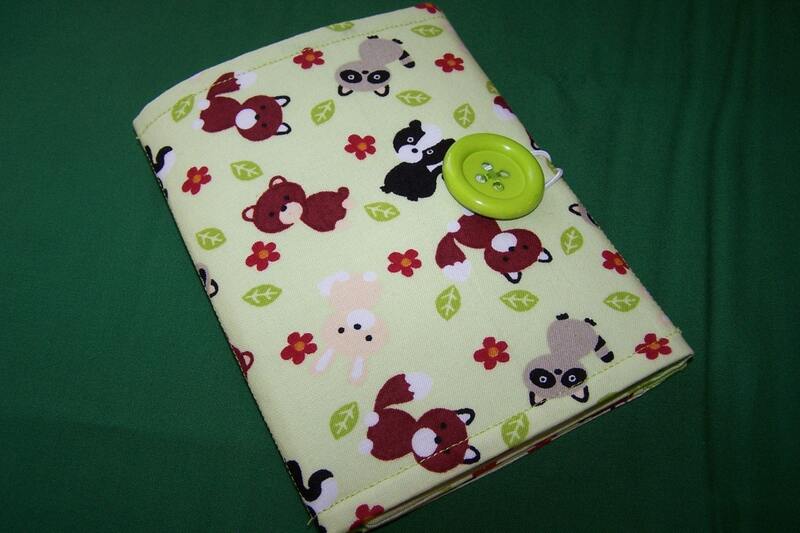 It holds eight crayons and has a special pocket for completed works of art. $13US and FREE SHIPPING to Canada until Sept. 7th. Check out the store for more options. This is the second part of my walk on West Queen West ( between Bathurst and Trinity Bellwoods Park). Click here for Part I. The stores in this area are so unique. Lots of artsy stuff, original fashion, lovely furniture stores and lots of great finds for kids. The things you find here, you won’t find anywhere else. Stores here open rather late and are closed on the odd day so if you have something specific in mind, best to call ahead to check their schedule. Check in for more of West Queen West tomorrow. Maybe you’ll want to head over this weekend! Posted in Activities & Events, Cool Products, Decor, Gifts, Ideas, Useful Info. You Name It Baby Promotion – One Day Left! The You Name It Baby discount for Mamapicks readers is about to expire tomorrow. The school year is about to begin and what could be more useful than a personalized lunchbox, pencil case or backpack? Mamapicks readers receive 10% off by entering promo code: MAMAPICK at checkout. Valid until August 25th. Posted in Exclusive Discounts, Gifts, Personalized. I don’t get to go downtown very often but when I do, my favourite area to explore is West Queen West. I start my walk on Queen and Bathurst and stroll to Trinity Bellwoods Park. The stores in this area are so unique. Lots of artsy stuff, original fashion, lovely furniture stores and lots of great finds for kids. The things you find here, you won’t find anywhere else. Stores here open rather late and are closed on the odd day so if you have something specific in mind, best to call ahead to check their schedule. This is part of a 3-part series so check in for more of West Queen West over the next couple of days. Pay with your Visa and get 15% off all regular and sale-priced merchandise (excluding taxes) when you present this coupon at any Old Navy location in Canada. This weekend, I am planning to go to this little trunk show at The Workroom (1340 Queen St. W. @ Brock). There will be about 15 local vendors selling children’s clothing, accessories and toys. I am going to try to go with the kids and hubby big mistake as there will be cupcake decorating and button making activities in the back garden. The Friends & Family Sale at Gymboree is on until Sunday, August 23rd. Print this coupon to receive 30% off. Ballet in the Park is a free, family-friendly performance that brings classical ballet to the outdoors. A daytime performance of The Emperor’s New Clothes will take place at 4pm on Saturday (Aug. 22nd) at Port Credit Memorial Park (in Mississauga near the Port Credit GO Station). The audience is encouraged to bring lawn chairs as there is an open lawn and seating is on a first come, first-served basis. A good friend just sent me a message about this coupon code. Rockprettybaby is an online Canadian store for “modern gear for baby, toddler and parents”. I have never shopped there myself but the shop looks great and the promo is for 40% off! Please note that the offer does not apply to Skuut Bikes and their “Coming Soon” section and everything is final sale when you use the code. Code: secret40 Valid: Aug. 20-21st. The Canadian National Exhibition (The Ex) is opening on August 21st and will run until Labour Day. On Friday, enjoy $1.75 admission in celebration of the 175th birthday of the city of Toronto. Buy your regular admission tickets before Thursday (Aug. 20th) and save 31%! Enjoy the first annual Shakespearience Festival at Todmoren Mills (67 Pottery Road). Performances, workshops and vendors. For kids, there will be Shakespearean style face-painting, workshops, colouring contest and costume exhibits. Check the website for a complete schedule and map. The Toronto African Dance Festival takes place at Yonge & Dundas Square this weekend. Kids sensation, Toopy and Binoo will be at Upper Canada Mall (Yonge + Hwy. 9, Newmarket) on Saturday & Sunday for special 30-minute musical performances as part of their popular Treehouse tour. The tour also features “Make ‘n Display with Play Doh,” an opportunity for the kids to play with Play Doh products before the show. Upper Canada Mall is the most family-friendly mall I’ve been to with a children’s play area and a lounge for teens. Head over to the Got My Kids Show on Sunday at the Terrace Banquet Centre (Rutherford + Creditstone, near Vaughan Mills Shopping Centre in Vaughan). Here you will find a showcase of the best of York Region’s child related businesses and product providers. We went last Sunday and the kids had the best time (due to cotton candy, balloons, jumping castle, characters, etc.) and we collected lots of information about all kinds of services and programs in York Region that we didn’t know about. Enjoy the first annual Shakespearience Festival at Todmoren Mills. Performances, workshops and vendors. For kids, there will be Shakespearean style face-painting, workshops, colouring contest and costume exhibits. Check the website for a complete schedule and map. Kids sensation, Toopy and Binoo will be at Upper Canada Mall on Saturday & Sunday for special 30-minute musical performances as part of their popular Treehouse tour. The tour also features “Make ‘n Display with Play Doh,” an opportunity for the kids to play with Play Doh products before the show. Upper Canada Mall is the most family-friendly mall I’ve been to with a children’s play area and a lounge for teens. 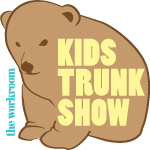 Head over to the Got My Kids Show on Sunday at the Terrace Banquet Centre near Vaughan Mills. Here you will find a showcase of the best of York Region’s child related businesses and product providers. We went last Sunday and the kids had the best time (due to cotton candy, balloons, jumping castle, characters, etc.) and we collected lots of information about all kinds of services and programs in York Region that we didn’t know about. When my kids received personalized shirts from a dear friend in Vancouver, I knew I had to find out where she got them. Simply Colours! This amazing online Canadian store is all about personalizing clothing for kids. They offer a great variety of styles and sizes run from newborn to 8 years. The quality is superb and the price is just right ($15-$25). If you are looking for an unforgettable gift, you will easily find it at Simply Colours. Mamapicks readers get 10% off any order! How exciting 🙂 Just click here and enter code pick09 upon entering the website. I love how the site allows you choose everything from style, font and colours…and then shows you an image of what your creation will look like. Gifts can be shipped worldwide and can arrive in a gorgeous gift box. Browsing through the site will give you tons of ideas! My husband and I always (well, we’ve only had kids for three years…) like to create our children’s birthday cakes from scratch. It’s a fun project to do together. The Boy’s cakes have always been based on a story that he loves. It has been easy for us to come up with ideas since he is one of those kids who gets really attached to certain books. However, The Girl is less particular and we are looking for inspiration for her upcoming 2nd birthday cake. See the unbelievable ideas in this Parenting showcase of 31 cakes. I like the detailed explanations on the photos of the cakes that reveal their nifty tricks. You’ll need to scroll down for those! The IKEA Eina storage unit goes for $89.99. Useful and reasonably priced…but it could use a coat of paint to spice it up a little (chalkboard paint perhaps?). You can also glue LEGO base plates on top to make it into a LEGO table. You Name It Baby Discount Still Valid Until Aug. 25th! If your little ones go to school, you probably spend a large part of your weekends at birthday parties for kids you hardly know. 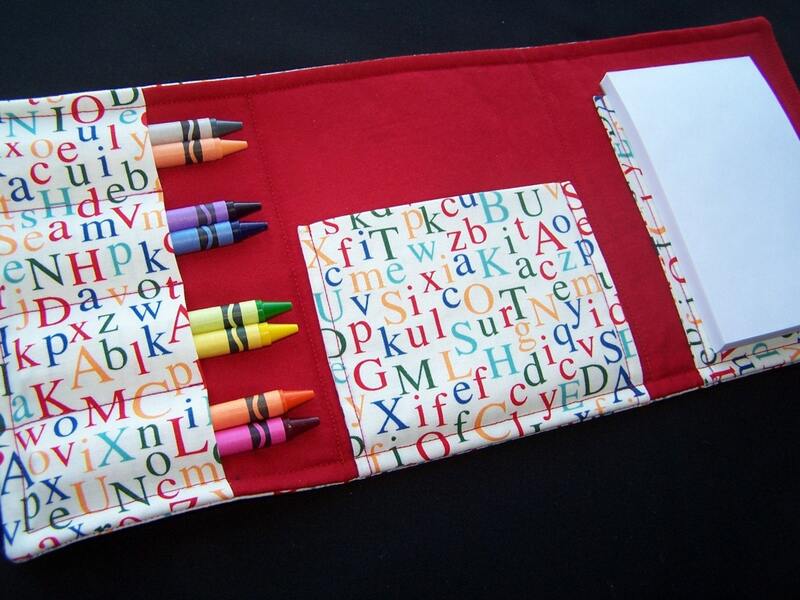 If you are on a budget but still want to buy something special, You Name It Baby’s Crayon Keeper is sure to be a hit. $9.99 each plus $5 if you want it personalized (of course you do!). You can add a nice sketch book to the bag and you are done. The Crayon Keeper is perfect for restaurant-distraction-action. Mamapicks readers receive 10% off on any order! Simply enter promo code: MAMAPICK at checkout. Valid until August 25th. Earthchild: All Items for $18 or Less! When my kids received personalized shirts from a dear friend in Vancouver, I knew I had to find out where she got them. Simply Colors! This amazing online Canadian store is all about personalizing clothing for kids. They offer a great variety of styles and sizes run from newborn to 8 years. The quality is superb and the price is just right ($15-$25). If you are looking for an unforgettable gift, you will easily find it at Simply Colors. I love how the site allows you to choose everything from style, font and colours…and then shows you an image of what your creation will look like. Gifts can be shipped worldwide and can arrive in a gorgeous gift box. Browsing through the site will give you tons of ideas! Posted in Cool Products, Exclusive Discounts, Gifts, Ideas, Personalized. I’ve written about this amazing store before. They are expecting their Fall line any day now…but until then, everything in the store is $18 or less. I was there this morning and saw lots of stuff in sizes 6-12 months and 12-18. Not much left for the 2/3s but there are bigger sizes. Most tempting are the pant & shirt combos that are a steal at $18. Certainly worth the trip to stock up for next summer. Earthchild‘s designs are pure+ simple. The company uses organic fabrics and is committed to manufacturing clothing in a socially and environmentally responsible manner.